KALININGRAD, Russia (AP) Morocco has lost both its matches at the World Cup and hasn’t scored a goal. That doesn’t mean Spain will have it easy against the North Africans. Spain’s new coach Fernando Hierro is wary of the Moroccan threat. ”Anybody who thinks it’s going to be very easy to score and win by a landslide, especially during this first stage is wrong,” he said. So don’t expect many changes from Spain in Hierro’s third match in charge since his sudden appointment following the dismissal of Julen Lopetegui on the eve of the World Cup. Morocco’s desire to leave Russia on a high note may even play into Spain’s hands if they press forward and leave more space at the back. If they do, Spain has the man to capitalize: Diego Costa already has three goals in two matches in Russia, one fewer than tournament top scorer Cristiano Ronaldo. But even if Morocco is more attack-minded, the Atletico Madrid striker will still have to break through a tough defense that has only conceded a single goal in each of its defeats so far. With Mehdi Benatia, a key member of the miserly Juventus backline in the Italian Serie A, anchoring its defense, Morocco kept six clean sheets in World Cup qualifiers. Although Morocco has lurched from one problem to another in Russia. Even before the tournament started, the country lost its bid to host the 2026 World Cup when FIFA chose alternative option from North America. The team’s medical staff came in for criticism for its handling of the head injury Noureddine Amrabat sustained in the opening loss to Iran. Then Amrabat earned his team a FIFA rebuke for criticizing the referee in its 1-0 loss to Portugal. Morocco, playing at its first World Cup in 20 years, has a right to feel unlucky – it outplayed both Portugal and Iran in stretches of both those matches, but failed to find the net. Against Iran, an injury-time own goal was the only score. The Atlas Lions will be hoping their luck finally changes against Spain. Good question. The winner of Group B plays Group A’s runner-up on June 30 in Sochi while Group B runner-up travels to Moscow to face Group A winner. With host Russia and Uruguay both on six points in Group A and certain to advance, it’s impossible to predict the round-of-16 matchups. A slip by Spain or Portugal on Monday could still cost them a spot in the knock-out stage and allow Iran into the round of 16. After two matches each in Russia, Iberian Peninsula neighbors Spain and Portugal both have four points in Group B with a win and a draw. Both teams have scored four goals (including three against one another) and conceded three. Get ready to consult FIFA’s tie-breaker rulebook if they both draw their final matches. 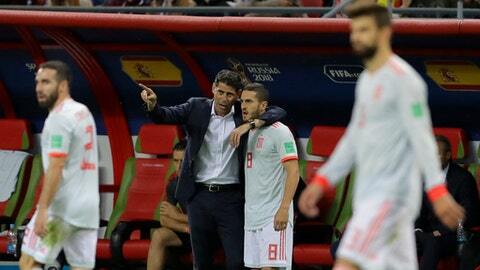 ”The last matches are going to be complicated for everybody,” Hierro said. This World Cup was supposed to be Moroccan midfield playmaker Hakim Ziyech’s chance to underscore his qualities as he seeks to secure a transfer from his Dutch club Ajax. The Netherlands-born Ziyech has shown flashes of the incisive passing game that has sparked rumors of interest from Liverpool and Roma. Ziyech came in for criticism from Ajax fans last season for his inconsistency and his play in Russia has also been patchy so far. Spain defender Sergio Ramos is set to make his 16th World Cup appearance, taking him past midfielder Xavi Fernandez on the list of most appearances at the tournament for his country. Andoni Zubizarreta also played 16 World Cup matches for Spain, while another goalkeeper, Iker Casillas, holds the record with 17 matches, including the final Spain won in South Africa eight years ago.